Governor ML Panadda Disakul, Boonlert Buranupakorn, President of Chiang Mai PAO (not shown), and Chiang Mai Mayor Tassanai Buranupakorn hosted a reception party for Miss Thailand 2010 Kritchakorn Hormboonyasak at the Rati Lanna Riverside Spa Resort in Chiang Mai recently. 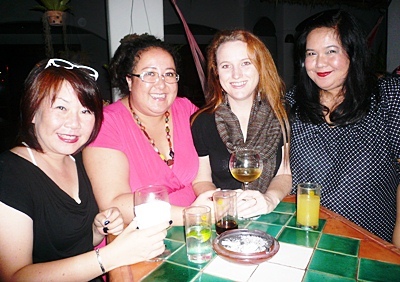 Petchnoi Osathaphan, Pim Kemasingki, Lamorna Cheesman, and Donjai Srivichainanda join a birthday party for Marisa Marchitelli of Sangdee Gallery at her house. 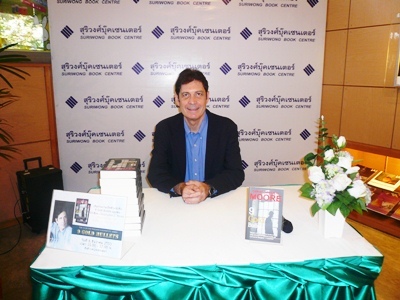 Well known author Christopher G. Moore was in Chiang Mai on December 6, 2011 to meet fans and sign copies of his latest book 9 Gold Bullets at Suriwong Book Centre. Copies are available for sale at the book center. Secretary to the President of Rotary Club of Chiang Mai North, Mr.Saran Chantalay (left) and Past President of the Rotary Club of Chiang Mai North, Mrs.Sunisa Frenzel (right) present a small token of appreciation to Managing Editor of the Chiang Mai Mail Shana Kongmun after she spoke at their weekly meeting at the Amari Rincome Hotel.